Tired of the same old chain pizza? Choose to eat better. Sparky’s packs more cheese, sauce, toppings, and flavor onto every single piece of pizza we make. Our Damascus pizza restaurant carries all of your favorite classic, meat, and vegetarian pizzas with a full roster of our very own in-house creations. Enjoy pizza designed by our chefs, staff, and customers like the savory buffalo chicken pizza with a sauce of creamy blue cheese and Frank’s hot sauce. Ditch your lifeless freezer pizza and do something nice for your taste buds. Get a perfectly crispy crust, fresh toppings, and the specials you love right here at Sparky’s. Every pie is handmade, hand tossed, and we don’t measure toppings to the slice. Our pizza chefs are artisans. The perfect topping distribution comes with experience, training, and time. Each pie is just a little different, and you’ll experience that homemade hand-crafted taste with every single bite. What goes into a Sparky’s pizza? Handmade, hand-tossed dough made from scratch every single day. Fresh Northwest sourced ingredients including our cheese and vegetables. 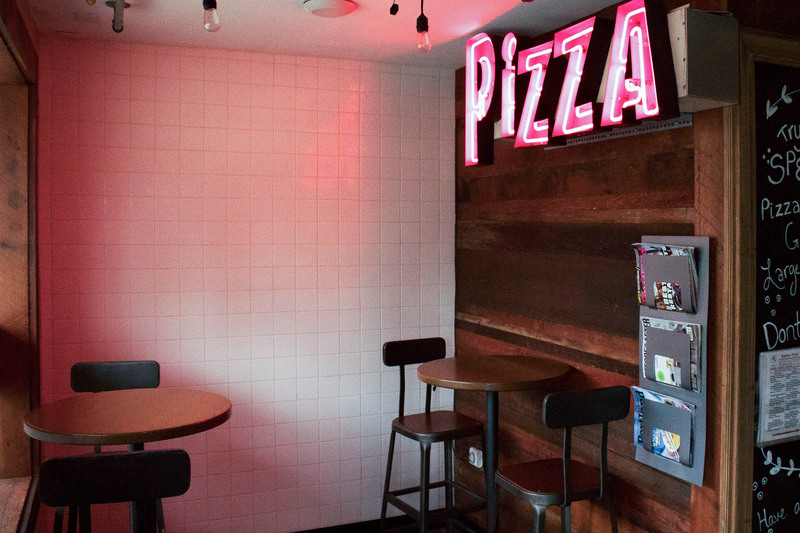 Classic New York style—big pizzas, plenty of toppings, and a foldable pie. 100% Fresh Mozzarella cheese and homemade pizza sauce. Pizza that’s worth the drive. We serve the entirety of Damascus, Oregon and the surrounding areas including Boring and Happy Valley. We’ve armed our chefs with the pizza industries favorite stone-lined ovens. That’s how we can have your pizza hot, boxed, and ready for pickup in as little as 10 minutes. We’ve got fans from Hillsview to Rockcreek and Carver. Our business might reside in Damascus Heights, but our pizza travels far and wide. What's tastier than Sparky's breadsticks? Sparky's parmesan breadsticks with seasoning and dipping sauce! Spending a day at the river with a pizza? There’s nothing better. We love to open a cold one, cast a line, and grab a slice. Every time we watch a baseball game and eat a whole Sparky’s pizza pie, our team wins. You could call pizza our good luck charm. You haven’t lived until you’ve eaten pizza on a putting green. We’ve elevated the game of golf forever. Join the revolution—all you need is a pizza, a putter, and your 7-iron. Call in, swing by, and pick up your pizza order now. We can have your hot pizza ready in as little as 10 minutes. Visit Sparky’s in Damascus today. Dinner is served.